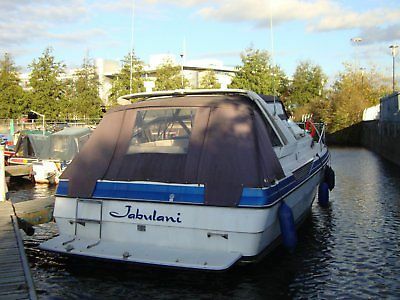 JABULANI has 4 fixed berths in 2 cabins with 2 more available in the salon and 2 on deck. This is a very spacious boat and has plenty of storage. Hot and cold water with calorifier and emersion heater. Shore power with cable and power sockets which includes 220 and 110 volts. CD/Radio with internal and external speakers also Panasonic TV. The boat passed the safety certificate in June 18 and expires June 30th 2022. The pictures show the boat with the winter canopy and a new canopy at a cost of 2000 pounds is also included. 2 new batteries and a new battery charger have just been fitted. A large file including repairs and servicing is included. Sensible offers will be considered. Please contact me if you require any further information. Email [email protected] or 07876544154.